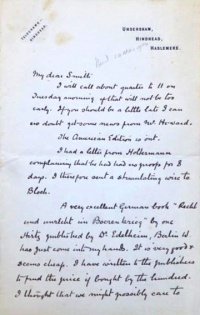 This letter was written by Arthur Conan Doyle on 10 march 1902  to Reginald J. Smith, editor of Smith, Elder & Co.. 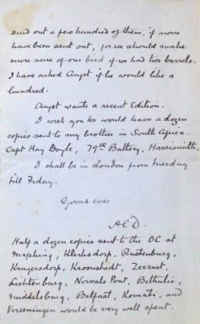 The book Conan Doyle initially refers to "The American edition is out" was his sixpenny propaganda monograph The War in South Africa: Its Cause and Conduct. I will call about quarter to 11 on Tuesday morning if that will not be too early. If you should be a little late I can no doubt get some news from Mr. Howard. The American Edition is out. I had a letter from Holtermann complaining that he had had no proofs for 8 days. I therefore sent a stimulating wire to Bloch. A very excellent German book "Recht und Unrecht im Boerenkrieg"  by one Hirtz  published by Dr. Edelheim, Berlin W. has just come into my hands. It is very good & seems cheap. I have written to the publishers to find the price if bought by the hundred. I thought that we might possibly care to send out a few hundred of them, if none have been sent out, for we should make more sure of our bird if we had two barrels. I have asked Angst if he would like a hundred. Angst wants a recent Edition. I wish you too would have a dozen copies sent to my brother in South Africa. Capt Hay Doyle, 79th Battery, Harrismith. I shall be in London from Tuesday till Friday. Half a dozen copies sent to the OC  at Mafeking, klerksdorp, Rustenburg, Krugersdorp, Kroonstadt, Zeerust, Lichtenburg, Norwals Port, Betherlie, Middelsburg, Belfast, Komati, and Kroeningen would be very well spent. ↑ Undated, but "Rec'd 10 Mar 1902" is penciled in. ↑ "Right and Wrong in the Boer War", by Friederich Hertz, published by Edelheim in Berlin in 1902. ↑ Typo by ACD, he was referring to Friederich Hertz. This page was last edited on 15 February 2018, at 13:08.